Not that one should spend too long seeking similarities between the work of the two men, for their styles are quite different. Both ploughed their own unique furrow. But it is telling that one of Yeats’ early projects was the compilation of the first ever edition of the Complete Works of Blake. And there’s little doubt that much of Yeats’ Greek and Biblical allusions arrived through a Blakean filter. What the two visionaries did share, however, was a deep unease about the profane nature of the world being built around them. The march of rationalism, for all its many wonders, left them both lamenting the willingness of humanity to trample upon The Sacred in the name of progress. More than a century after the birth of Yeats, the words of a song would declare “they paved paradise and put up a parking lot”, echoing a sentiment woven into the fabric of much of the poet’s work. For just like Blake before him, Yeats saw clearly the ultimate destination of scientific progress without spiritual guidance. And it was a cold, grey place with little room for the human soul. In the 1940s, Albert Einstein would write… Science without religion is lame, religion without science is blind. He might well have been channeling Yeats when he did so. 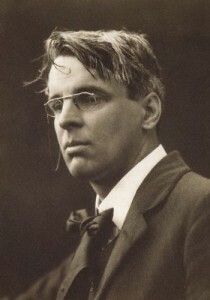 And yet WB Yeats, a product of the Romantic interpretation of Irish mythology prevalent in the late 19th century, inspired by Blake and the Pre-Raphaelite movement, and deeply rooted in the rural landscape of Ireland’s west coast, nonetheless formed friendships with Ezra Pound and other modernists and lived much of his life in the cities of Dublin and London. A supporter of Irish independence and yet enamoured with aristocracy and monarchy – institutions he felt might be capable of preserving traditional values in an increasingly materialistic world – Yeats was shocked and humbled when Irish independence emerged from working class socialism, a movement he had openly scorned. But true wisdom possesses a willingness to leave behind even the most cherished of beliefs when they are discovered to be without merit, and although Yeats was certainly never a revolutionary socialist, he acknowledged the clear debt that Irish independence owed to that movement and graciously accepted the invitation from the socialists to join the first Senate. Learning from the terrible mistakes of the Civil War, it was understood that a multitude of voices would strengthen the fledgling nation and that harmony could not be achieved by insisting all sing the same note. His time in politics lasted less than a decade and was curtailed by ill health, but his fiercely anti-clerical stance and championing of sexual liberalism (in 1920s Ireland!) remind us, like the work of James Joyce, that the chokehold gained by the Catholic Church on the Irish body politic was not inevitable and that the explosion of creativity and revolutionary fervor that gripped the nation in those post-1916 years could have led anywhere at all. A very nice tribute. Here is my favourite poem of his. with mr yeats” it is a majestic marriage of mystic music set to mystic words ! mr yeats the rock star!